'Transit West' includes new bus routes and a transit pass for more than 9,000 University of Southern Maine students, faculty and staff members. 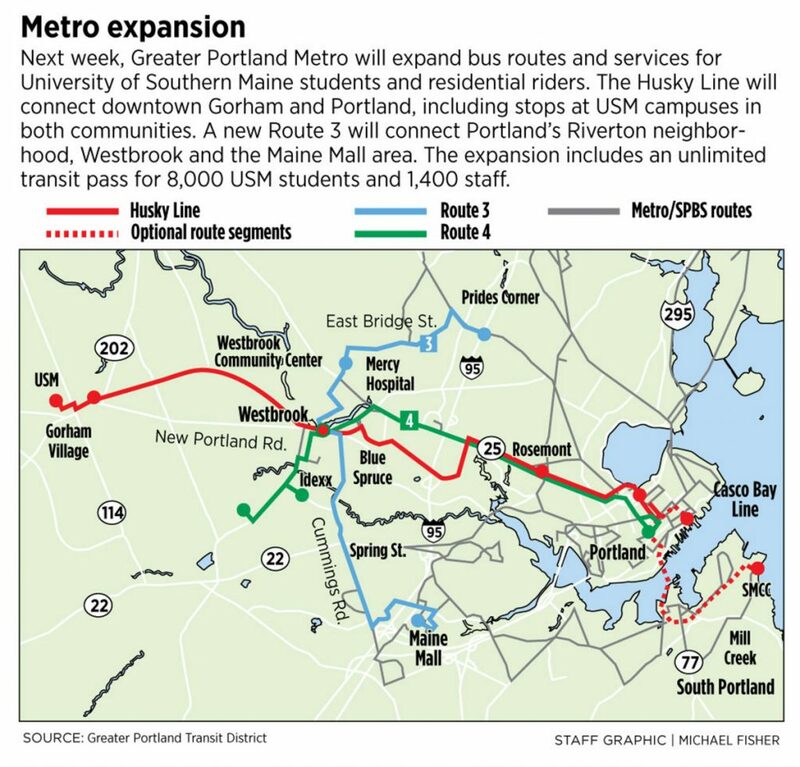 The largest public transit expansion in two decades will launch next week, when Portland Metro begins a new service to Gorham and adds a bus line across Westbrook. The expanded service includes a unlimited transit pass for University of Southern Maine students and staff, projected to add hundreds of thousands of new boardings a year for the growing transit agency. Portland Metro says the service that begins next week is the state’s biggest expansion of public transit since Amtrak began rail service between Maine and Boston in 2001. “In general, this is the biggest expansion Metro has ever advanced, and the biggest expansion of public transit service since the Downeaster went live,” Metro General Manager Greg Jordan said, referring to the Amtrak passenger rail between Maine and Boston that opened in 2001. The $4.5 million Transit West expansion was proposed more than two years ago as a way to improve bus service in Westbrook and west Portland, provide public transit to Gorham, and integrate USM’s transportation system with the public bus agency. More than three-quarters of the expansion was paid for by federal grants with local payments from Portland, Westbrook and Gorham covering the rest. Anchoring the expansion is the Husky Line, a limited-stop bus service designed to carry students and commuters on an 11-mile route from downtown Gorham to USM’s Portland campus and Monument Square downtown. The new line, which launches on Monday, will be serviced with new natural-gas fueled buses outfitted with high-speed wifi and emblazoned with the USM Husky mascot. The service will have seven stops, in Portland, the USM Portland campus, Westbrook and Gorham, with 30 round trips on weekdays, leaving about every half hour. Weekend service will be limited, with 19 trips on Saturday and 15 trips on Sunday. Although the route accommodates USM students, it is open to the public like any other Metro bus, Jordan said. Longer service hours, more frequent pickups and better weekend service were key aspects in a $400,000 annual contract between Metro and USM, University President Glenn Cummings said in an interview Wednesday. “They have been able to deliver everything we asked for,” he said. The Husky Line will replace the university’s existing transportation program, a shuttle between the Gorham and Portland campuses serviced by private bus companies. The three-year Metro contract costs about $6,000 more, but has an added benefit that 8,000 students, and 1,400 faculty and staff get an all-system transit pass to get to classes, jobs and internships, Cummings said. A USM identification card will serve as the pass. The university promotes the Husky Line and transit pass as part of a commitment to lower its transportation footprint by 20 percent in the next seven years, and become carbon neutral by 2040. It also aligns with the push to make USM a “community-engaged university,” Cummings said. 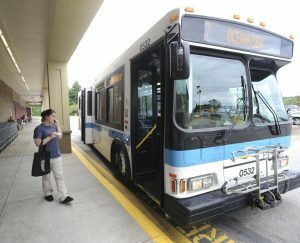 Metro estimates the USM transit pass could add up to 500,000 boardings a year to the system, an increase of about 25 percent. In addition to the Gorham connection, Metro will open a new bus line this Sunday with a direct connection from Portland’s Riverton neighborhood to the Maine Mall in South Portland through Westbrook. Rides on the new route will be free this Sunday through Wednesday. Route 3 will run between the Riverton Hannaford and the shopping mall, with stops at the Westbrook Community Center and downtown transit hub and into Target Plaza off Running Hill Road in South Portland. The route includes stops at the Millbrook Estates housing complex on Bridge Street in Westbrook, the Blue Spruce Farms housing development on Spring Street and the Husson University campus on County Road. Route 3 will take over some of the stops now served by Route 4, improving service on that line, Jordan said. Metro has greatly expanded its reach in the past half-decade, contracting with Portland School District to give high school students transit passes and adding a commuter service linking downtown Portland and communities north of the city – Yarmouth, Freeport and Brunswick. Metro said it had more than 1,850,000 riders in 2017, almost 40,000 more than the year before and a 27 percent increase from 2013. The expansion comes as Metro is planning to add zero-emissions vehicles to its fleet. On Tuesday, Rep. Chellie Pingree of Maine, D-1st District, announced Portland-area public transit will receive almost $2.3 million to purchase electric buses. The grant is part of a joint proposal by Metro, ShuttleBus-Zoom, in Biddeford and Saco, and the Maine Department of Transportation, which will use $3 million from a settlement with Volkswagen to buy zero-emission buses, Jordan said.